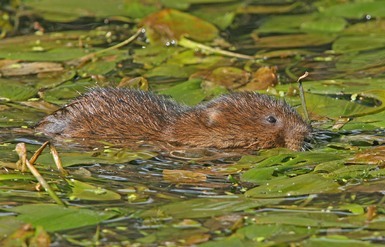 Water Vole, Arvicola amphibious. ‘Ratty’ in Wind in the Willows is a Water Vole! Despite that name, they are not rats and they suffer from much unfair persecution when mistaken as such. Once common and widespread, this species has suffered a significant decline in numbers and distribution. In Barnsley it is now quite localised and has probably been lost from the uplands. Water Voles inhabit the banks of slow-flowing rivers, streams and ditches as well as still water such as lakes, ponds and dikes. They need silt-shored banks for burrowing or slow-moving and relatively deep water courses. Their presence can be determined by searching for their burrows at and above water level, together with footprints, characteristic piles of droppings (latrines) and feeding remains. Water vole, Arvicola amphibiuous, is a Priority Species in the UK Biodiversity Action Plan 2007 (UK BAP). 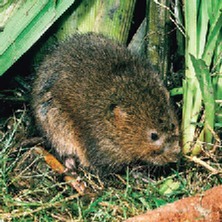 The Water Vole is the largest of the British voles with a head and body measuring around 20 cm. Found in and along our waterways, it has a blunt nose, small ears and furry tail. 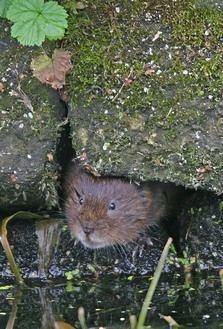 Water Voles do not hibernate, but remain in their burrows for much of the winter with a food store. Water Voles need suitable habitat in close proximity to allow populations to expand and re-colonise areas. They also need areas to retreat to in the event of flooding. Unfortunately Mink have moved into many areas, increasing the threat to remaining populations. As the lower reaches of rivers become unsuitable for habitation, the distribution of Water Voles becomes discontinuous and existing sites become isolated and vulnerable. 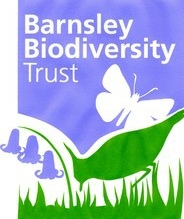 Information on the conservation of Water Vole, its distribution in Barnsley, its conservation and proposed actions can be found via the links below.